The current county of Denbighshire only came into being in 1996, and comprises the former county of Clwyd which itself included part of Merionethshire, part of Flintshire and the old county of Denbigh. The county contains a diverse range of house types, from the rural, storeyed stone-walled Snowdonia- plan houses to half-timbered, jettied town houses, gentry hall houses and abundant large Elizabethan and seventeenth-century houses to the east of the county. The landscape is equally diverse, with the uplands of the Berwyn mountains in the west & the fertile Vale of Clwyd to the east, each with their own particular vernacular style of building. 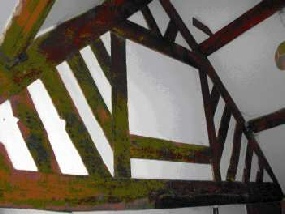 Many houses were identified as worthy of inclusion in the “Dating Old Welsh Houses” project, to have their timbers dated using dendrochronology. However because much of the timber used came from fast growing oak, they were not easy to date. The earliest surviving dated rural houses are timber-framed cruck-built hall houses with a central hearth on the floor and dating from the early to mid- 1400s. Succeeding generations replaced timber with stone walls and inserted fireplaces with large chimneys in the gable, on lateral walls or centrally in the house. This enabled upper floors to be added to provide additional privacy. Wealthier families also added cross-wings, or extensions alongside or at right angles. 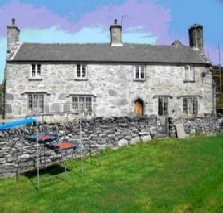 One of the oldest houses in Wales can be found near Corwen in the Dee valley. Plas Uchaf is a substantial hall-house dating from 1435, and was most likely to have been the home of one of the Barons of Edeyrnion, as was Branas Uchaf. Around 1400 the uprising led by Owain Glyndŵr was particularly active in the area, having houses at Sycharth and Carrog. The dearth of houses dating from that period has been attributed to this turmoil, but the Group lives in hope of identifying pre-1400 houses among those hidden away in the many beautiful valleys in the locality. The project works in partnership with The Royal Commission on the Ancient and Historic Monuments of Wales.